Here are the best San Juan hotels in Puerto Rico: La Concha Renaissance hotel in San Juan, Puerto Rico, , Marriott Resort & Stellaris Casino, Doubletree by Hilton San Juan, Caribe Hilton San Juan, The Condado Plaza Hilton, Best Western Plus Condado Palm Inn & Suites, The El Convento, Sheraton, Condado Vanderbilt Hotel, La Terraza de San Juan. The La Concha Renaissance San Juan hotel is perhaps the trendiest San Juan hotel and is ideal for travelers who like to mingle as well as be seen in the crowd. Located on the northeastern coastline in the Condado District, the La Concha Renaissance brings together elegance and quality to create an exceptional experience. The La Concha Renaissance is an interesting Modern-style high-rise building that was highly acclaimed when constructed. The La Concha Renaissance has 232 rooms and suites which have a fresh as well as contemporary décor. Guest rooms are spacious from the Pool Cabana at 300 square feet to an Ocean View with 400 square feet. Each of these styles has a private balcony and the Ocean View rooms have floor to ceiling windows for spectacular views. The La Concha Renaissance features seven styles of suites that range from a 445 square feet junior suite to a one-bedroom suite at close to 600 square feet. 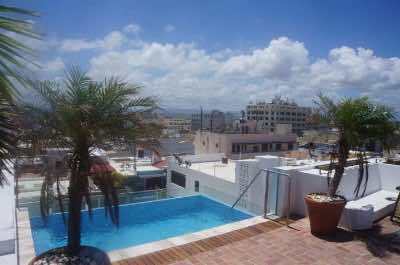 Other superb features are in suite whirlpools, kitchenettes and large patios with a view of the city or ocean. La Concha Renaissance is ideally situated on the gorgeous white sand Condado Beach where you will find plenty of space to relax, swim in the warm water and you can arrange your favorite watersport adventure quite easily. The La Concha Renaissance has three freshwater swimming pools including an adults-only Infinity and two other family-friendly pools. The La Concha Renaissance offers several other amenities for you such as a 24-hour casino, state-of-the-art fitness center and the incredible Spa at Condado Vanderbilt. The The La Concha Renaissance San Juan hotel is perfectly located for venturing off-property during the day and night with the Condado District featuring a farmers market, shopping mall as well as several superb restaurants. Dining at La Concha Renaissance offers seven different restaurants serving chic and eclectic cuisine from around the world. The Perla Restaurant is an absolute architectural marvel with its sea shell shape and ocean views as well as a wine list that contains some 4,000 bottles. In the evening La Concha Renaissance explodes with excitement with an onsite disco in the lobby bar which is a favorite with travelers and locals. Although there is plenty for children to keep busy with at La Concha Renaissance there is not a kids club. The San Juan Marriott Resort and Stellaris Casino is a luxury high-rise San Juan hotel, which is ideal for families and all-types of travelers. Located directly on Condado Beach along Ashford Avenue, the San Juan Marriott Resort and Stellaris Casino has plenty of amenities for everyone. The San Juan Marriott Resort and Stellaris Casino has a Modern architecture style with 525 rooms and suites that have a contemporary décor. The San Juan Marriott Resort and Stellaris Casino has six categories of rooms which range in size from 250 to 350 square feet. Rooms offer comfortable furnishings and feature private balconies with views of the city, pool or ocean. The three style of one-bedroom suites range in size from 600 to 950 suites with more living space and views of the ocean from a private balcony. Families can enjoy adjoining rooms or suites depending on the size of your family. The San Juan Marriott Resort and Stellaris Casino has a perfect location on Condado Beach where you can find tranquility on the white sand beach and revel in the warm waters while swimming or arranging for exciting watersport adventures. You can also indulge in your favorite libation and a light lunch beachside at La Isla Beach Bar. San Juan Marriott Resort & Stellaris Casino San Juan hotel has a two great freshwater swimming pool including one with waterslide for the children and there is plenty of room to relax on the deck. You can venture offsite during the day and immerse yourself in some of the best shopping in San Juan within the Condado District. When you need exercise there is a fitness center, tennis courts and the full service Ocean Club Wellness Center. Children will enjoy the amenities for them with an arcade and game room as well as the various water activities. You have lots of dining choices at the San Juan Marriott Resort and Stellaris Casino which includes several options for breakfast from buffet to ala carte. The La Vista Latin Grill and Bar is ideal with Caribbean cuisine and the Red Coral Lounge has small plates as well as the ability to transform into a nightclub later in the evening. When you stay at the San Juan Marriott Resort and Stellaris Casino you will be pleased with all of the amenities geared toward families that just want to have a good time. The Doubletree by Hilton San Juan is a top San Juan hotel in its mid-range pricing and is a favorite with business travelers and people looking to be close to Condado Beach. Located on De Diego Avenue in the trendy Condado District, the Doubletree by Hilton San Juan is only a short walk to the white sands of Condado and Ocean Park Beaches. 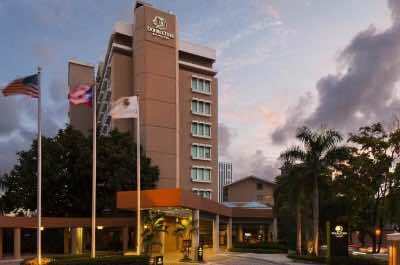 The Doubletree by Hilton San Juan has a Contemporary architecture with a sleek and chic décor in the 184 rooms. There are eight different categories of rooms which are spacious and offer various bedding choices from king to queen to Murphy. Rooms have a variety of views from garden to city but not all rooms have a balcony or patio. When you are ready to hit the beach you can take a complimentary shuttle to the exclusive Ocean Park Beach Club where you can relax on the pristine white sand or swim in the beautiful waters of the Atlantic Ocean. The Doubletree by Hilton San Juan has a nice freshwater swimming pool which features waterfalls and a beautiful deck with palm trees. During the day you can also explore the eclectic Condado District which features many fine shopping experiences and you are short walk from the Museum of Art. When you to stay in shape you can use the fitness center and you can find that special treatment at the full service Yelo Spa. Dining options at the Doubletree by Hilton San Juan hotel includes four restaurants including Café Pierre which specializes in international cuisine and the Silk features Asian dishes. Nightlife is abound at and around the Doubletree by Hilton San Juan where you can enjoy your favorite libation at the onsite lounge or you can venture to Bar Bero for live music. The Doubletree by Hilton San Juan is family-friendly but does not offer any type of kids club for children. The Caribe Hilton San Juan is one of the best family and kid friendly San Juan hotels, which contains enough amenities onsite to keep everyone busy. 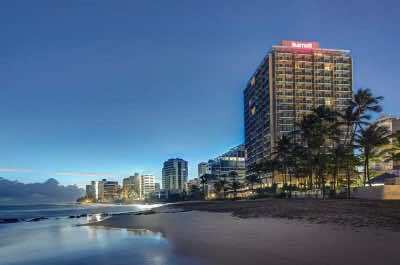 Located on a remote peninsula along the northern coastline between Old San Juan and Condado Beach, the Caribe Hilton San Juan is situated on 17-acres of tropical paradise along the Atlantic Ocean. The Caribe Hilton San Juan is a luxury high-rise mega complex that features two separate towers of a Modern architecture which house 910 rooms as well as suites. Guest rooms vary in floorplan from the tower and garden areas with ocean view units in the tower and in the garden area the views feature the city, resort as well as a manicured tropical area. For longer stays the garden view junior suite is perfect with a small kitchenette and more living space on a patio that opens up to fish ponds. The Caribe Hilton San Juan has eight categories of suites that range from a junior suite at 453 square feet to a one-bedroom at 850 square feet to a two-bedroom bi-level at almost 2,000 square feet. Some suites have kitchenettes and each suite has a private balcony or patio with spectacular views of the city, gardens, the lagoon, resort as well as ocean. The Caribe Hilton San Juan also features several villas with spectacular amenities, extra living space and a kitchenette or full kitchen as well as big views of the lagoon from a private balcony. The Caribe Hilton San Juan has a small private golden sand beach where you can relax in the sun or play in the warm waters or arrange your favorite watersport adventure. The Caribe Hilton San Juan has two gorgeous freshwater swimming pools as well as one Infinity pool which feature a multi-tier construction with waterfalls, swim-under bridges and the surrounding deck has plenty of palm trees for shade with picturesque views of the beach area. There is a kid’s pool which is ideal for families and the little ones. You can even quench your thirst at the swim-up pool bar and poolside at Atlantico Pool Bar and Grill. When you are tired of the crowds you can escape to the tropical garden areas and listen to the many birds in the lush green landscape. The Caribe Hilton San Juan hotel has a dedicated entertainment staff which keeps the activities going on all-day. Another added plus are the tennis courts, the fitness center and full service Olas Spa onsite which will ensure a relaxing episode during your vacation. Children will like the Kidz Paradise Club which offers organized activities and there is a video arcade as well as a playground to keep them busy all-day. 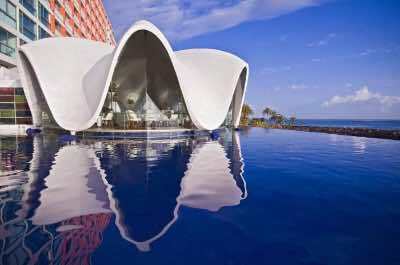 You will be thrilled with your dining options at the Caribe Hilton which includes eight restaurants. Dining choices for you range from breakfast at Palmeras to Asian dishes at the Lemongrass to Italian at Il Giardino La Trattoria to fine dining at Morton’s Steak House. You can indulge in the nightlife at the Caribe Hilton San Juan at Caribar where live music is played on various evening of the week or you can take a short cab ride to La Placita, the hottest nightclub in the Condado District. 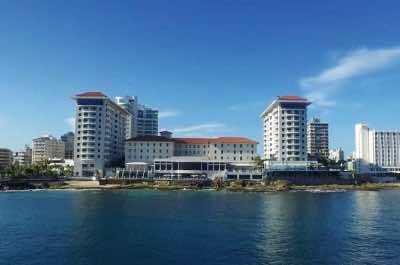 The Condado Plaza Hilton is a pleasant San Juan hotel, which allows for some solitude and easy access to a small beach. Located on a remote peninsula in the Condado District, the Condado Plaza Hilton has an upbeat atmosphere with nice amenities for you to enjoy. Situated in a Modern-style high-rise building, the Condado Plaza Hilton has 589 rooms and suites which feature a chic interior décor. Rooms very in size from a guestroom at 290 square feet to an ocean view with 390 square feet of living space. Each room style has a private balcony with views that vary from picturesque ocean to the surrounding city. The Condado Plaza Hilton has three categories of suites which range from a junior suite at 640 square feet with a nice living area to an Ocean suite that is over 1,000 square feet with a separate living area. Family junior suites offer additional bedding families which is a plus. Most junior suites have a private balcony and floor to ceiling windows for great views of the city or ocean. Ocean suites have big vistas of the ocean from floor to ceiling windows. The Condado Plaza Hilton has a small white sand beach associated with a small inlet from the ocean where you can relax or have fun in the sun. 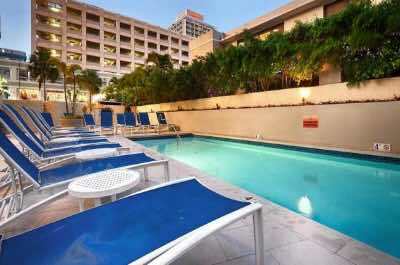 The Condado Plaza Hilton San Juan hotel has two nice freshwater swimming pools and each is surrounded by nice tropical garden. The location of the Condado Plaza Hilton is somewhat isolated and other activities will probably require a short taxi ride. Dining at the Condado Plaza Hilton is highlighted by Pikayo where you will indulge in a price-fix menu of a several course meal. There is also four other restaurants onsite which range from Asian delicacies at the Eight Noodle Bar to breakfast at Denny’s to a quick lunch at Viaggi Grab-‘N-Go. You don’t need to venture off-property for nightlife with four bars and lounges with live music on selected evenings. Although the Condado Plaza Hilton is family-friendly there is not a kids club associated with this property but there is certainly lots of amenities to keep the little ones busy while you enjoy your relaxation. The Best Western Plus Condado Palm Inn and Suites is a mid-range San Juan hotel, which is a great choice for all types of travelers who want the best of all worlds. Located on Condado Street within the chic Condado District, the Condado Palm Inn and Suites is just a short walking distance to the white sands of Condado Beach. The Condado Palm Inn and Suites was completely renovated in 2012 and consists of two modern-style towers which contain 151 units. The Condado Palm Inn and Suites has comfortable rooms which include a bright décor, a variety of bedding choices as well as a private balcony with views of the city and higher floors can see the beach in the distance. The Condado Palm Inn and Suites has a number of one-bedroom suites which feature kitchenettes, plenty of separate living space and a private balcony with views of the ocean. Although the Condado Palm Inn and Suites is not located on the beach, you will be just a short walk from the iconic white sands of Condado Beach where you can relax or frolic in the sun. 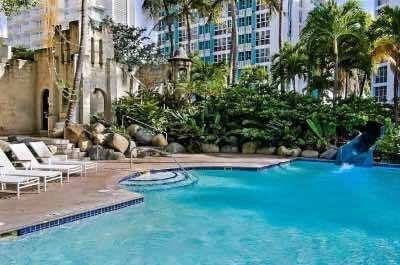 The Condado Palm Inn and Suites has two freshwater swimming pools which include one for adult and another for children. Situated within the Condado District also gives you the opportunity to explore many sights on foot such and a short taxi ride to historic Old San Juan. When you stay at the Condado Palm Inn and Suites San Juan hotel, you can devour a complimentary breakfast each morning in the Palm Café. During lunch and dinner hours you are allowed to bring in outside food to enjoy in this café. Dining offsite in the Condado District is eclectic with many fine restaurants such as Pannes for Latin cuisine and Oceano which prepares fresh seafood. Nightlife is abundant nearby the Condado Palm Inn and Suites where you can visit the La Concha Casino, salsa dancing at Nuyorian Café and great jazz at Café Carli Concierto. Although there is not a kids club at the Condado Palm Inn and Suites, children and families will benefit from the many activities nearby as well as special pricing for children under 12 years of age. The El Convento is a luxury San Juan hotel which is the perfect romantic retreat for you in the historic city of Old San Juan. Located on Cristo Street adjacent to San Juan Cathedral, the El Convento was transformed into a superb hotel in 1959 with Rita Haywood attending the grand opening. Originally constructed in the 17th century the El Convento has a special Spanish-colonial architecture which attracts numerous travelers just taking photographs. The boutique hotel, El Convento has just over 50 rooms and suites that feature a splendid Spanish interior décor with plenty of antiques from yester year. There are nine categories of accommodations at the El Convento which range from a queen superior to garden terrace to queen deluxe to a well-appointed Pablo Casals suite. All rooms and suites are furnished with a private terrace or Juliet-style balcony with views of the San Juan Bay, the San Juan Cathedral or historic Old San Juan. You will enjoy the prime location and amenities offered at the El Convento which include access to the El Convento Beach Club located a short taxi ride away at a sister property along Isla Verde Beach where the snorkeling is nice. You will be amazed at the views of San Juan Bay as you relax around the rooftop freshwater swimming pool and there is a nice walking trail around San Juan Cathedral Square as well as an excellent fitness center onsite. The prime location also affords easy walking to such attractions as the Pablo Casals Museum, Galleria Nacional and San Felipe del Morro Fortress. The El Convento San Juan hotel has excellent dining onsite with three restaurants. The Patio del Nispero is open for breakfast, lunch and dinner serving local cuisine in the courtyard. You can also indulge in Spanish tapas at El Picoteo and Italian cuisine at Pizza e Birra. Guests are also treated a complimentary wine and cheese tasting nightly on the rooftop terrace. Nightlife can include shopping at the Coach Outlet store, going to a local casino or indulging in a local libation at El Batey. The El Convento is an ideal romantic retreat for couples but business travelers and families will also find this hotel to be very special. The Sheraton Old San Juan is a superb mid-range San Juan hotel which is a great choice for travelers wanting to be in the middle of the action. Located on Brumbaugh Street in historic Old San Juan, the Sheraton Old San Juan is situated along the waterfront with views of San Juan Bay. The Sheraton Old San Juan has 240 rooms and suites which are contained in a wonderful Spanish-colonial style building. Traditional rooms are comfortable with views of the city from large windows. Deluxe rooms have added amenities with floor to ceiling windows that feature views of the San Juan Bay. The Sheraton Old San Juan has two-bedroom suites with plenty of space and most have balconies which overlook the bay. 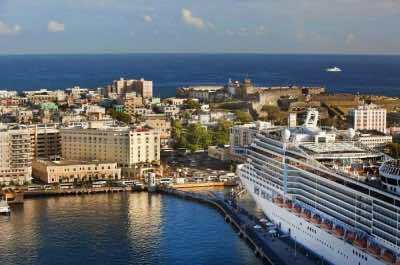 One of the best things about the Sheraton Old San Juan is the location in this historic city. You are just moments away from exciting attractions like San Juan National Historic Site which includes Fort San Cristobal, La Fortaleza and San Juan Cathedral. 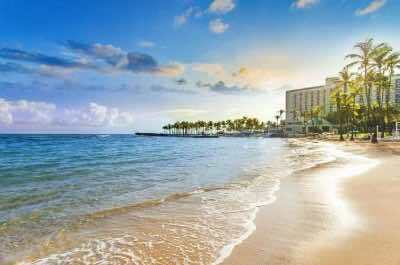 You are also just a short drive away from the white sands of Condado Beach and great snorkeling at Isla Verde Beach. The Sheraton Old San Juan hotel has a nice rooftop freshwater swimming pool which boasts great views of the city and San Juan Bay. You can get your exercise at the onsite fitness center but there is not a full service spa. Shopping in Old San Juan is fabulous and you can wander the nearby streets visiting many different vendors for that perfect souvenir. Dining at the Sheraton Old San Juan includes Palio which serves up excellent Spanish fusion cuisine and you are within walking distance to many other dining options such as Marmalade Restaurant and Wine Bar as well as the Dragonfly when you want exciting Japanese dishes. Nightlife can be found off-property at such establishments as Senor Frogs and El Farolito where you can listen to live local music. The Sheraton Old San Juan is comfortable for children even without a kids club and there is plenty of things to do in the Old San Juan to keep them busy. The Condado Vanderbilt Hotel is a luxury high-rise San Juan hotel, that is fantastic for when you want style and unprecedented service. Located on Ashford Avenue adjacent to the spectacular Condado Beach on the northeastern coastline of the island, the Condado Vanderbilt Hotel was constructed in 1919 and completely refurbished to its glory days in 2014. The Condado Vanderbilt Hotel has a stylish architecture and once inside the hotel shines with pride and history. The Condado Vanderbilt Hotel has 319 rooms and suites which are housed in two buildings, the original Spanish-Colonial and a newer Tower section. There are three categories of Heritage rooms to range in size from 295 to 350 square feet. Each room has a view of the city or ocean from its large windows. In the newly built Tower section there are three styles of rooms which have a modern décor and are similar in size around 450 square feet. The Tower rooms have a nice view of Condado Beach and the ocean from large windows. There are four categories of one-bedroom suites that have a fresh modern décor with various floorplans which range from 650 to 812 square feet and each has a great view of the city or ocean from a private terrace. Two-bedroom suites are fabulous with various floorplans and extra-large terraces which provide even more living space as well as views of the ocean or city. The Condado Vanderbilt San Juan Hotel has ideal beach access and in just a few steps you will be enjoying the warm waters and beautiful sun. You can relax under a beach cabana on Condado Beach or stretch out at the Beach Tower which has a stunning view of the ocean from an Infinity freshwater swimming pool as well as a second pool for adults-only which has a fabulous deck space. When you are ready to unwind you can enter the Vanderbilt Spa or if you want to exercise there is a nice fitness center. There is plenty of shopping in the Condado District which includes specialty retailers like Louis Vuitton, Cartier and more along Ashford Avenue. Dining at the Condado Vanderbilt Hotel is an experience in itself. There are four restaurants that range from the expertly prepared cuisine at 1919 to indulging in Mexican dishes at the Taco and Tequila. With such a great location in Condado you can venture off-property and dine at Yantar which serves Spanish fusion cuisine or di Parma Trattoria for superb Italian dishes. Nightlife is abundant on Condado Beach and you are sure find your groove at such local discos as La Placita which features local live music nightly or you can enjoy a friendly gambling game at the onsite casino. The Condado Vanderbilt Hotel does allow children but does not offer any type of kids activities. La Terraza de San Juan is a beautiful boutique San Juan hotel which has an ideal romantic atmosphere. Located in the heart of Old San Juan on Calle del Sol, the La Terraza de San Juan is an upper mid-range hotel with lots of old world charm. La Terraza de San Juan is situated in two 19th century Spanish-Colonial buildings which have been refurbished back to the glory days of exquisite architecture. 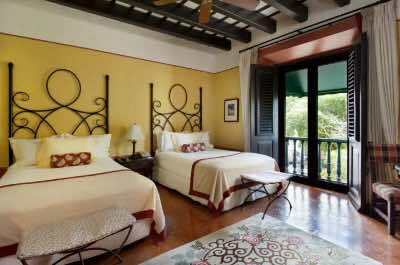 La Terraza de San Juan 23 rooms and two-bedroom suites which have a grand colonial décor with plenty of antiques in each unit. La Terraza de San Juan hotel has two categories of rooms which include deluxe and superior with varying floorplans, bedding choices as well as varying views of the city from the windows or balcony. First class and deluxe balcony suites are one-bedroom with an additional living room for space with an old world charm and the deluxe balcony suite has an amazing patio which overlooks the city as well as the bay. The deluxe two-bedroom suite has two bathrooms and full kitchen and is perfect for families or groups. The garden suite is also two-bedrooms with an open air living room and a patio opening up to a manicured garden for relaxing. The architecture and stylish rooms are exquisite and maybe the most impressive part of the La Terraza de San Juan is the rooftop Infinity plunge pool which has a fantastic view of the bay and city as well as a poolside bar serving cold libations. La Terraza de San Juan is a short 15-minute drive to the spectacular Condado Beach and you can explore with ease many of the historic attractions in Old San Juan like the Cathedral of San Juan Bautista, Puerta San Juan and La Fortaleza. When you stay at the La Terraza de San Juan you will enjoy a complimentary breakfast and access to some of the best restaurants within Old San Juan such as St. Germain Bistro and Café as well as Café Manolin where you can indulge in great Latin cuisine. La Terraza de San Juan hotel has a nice bar and lounge which opens onto the street for you to feel like you are really experiencing the local culture of the historic district. La Terraza de San Juan does accommodate families but there are not any children’s facilities or activities.